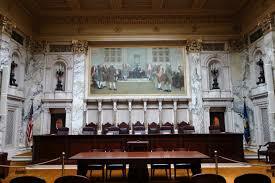 On Tuesday, February 20, Wisconsin held its State Supreme Court Primary election. Voters chose Milwaukee County Circuit Court Judge Rebecaa Dallet, who received 35% of the vote, and Sauk County Circuit Court Judge Michael Screnock, who took 46%, to square off in the April 3 general election. A third candidate, Madison attorney Tim Burns, received 18% of the vote and will not be on the April ballot. The winner of the general election will fill the seat vacated by Justice Michael Gableman, who is not seeking second term. Dallet currently serves as a Milwaukee County Circuit Court Judge. While Supreme Court elections are non-partisan, she aligns with the Democratic Party. She made her political affiliations very clear in a campaign ad in which she criticized President Donald Trump. Her campaign has highlighted what she sees as a need for criminal justice reform. “I see victims of violent crime, especially in our poorest neighborhoods, struggling to find a way as guns, drugs, and gangs devastate their community. And I see neighbors trying to get their lives back on track, but stuck in a criminal justice system that needs reform,” her campaign website says. Screnock is the conservative candidate in the race. He’s currently a Sauk County Circuit Court Judge. Due to his political affiliations, he’s been able to easily draw distinction between his opponents and himself. In his campaign message, Screnock has promoted his conservative judicial philosophy by invoking that the courts are just one part of three branches of government. “When a court is asked to interpret law, its role is to declare what the law is, based on what the legislative and executive branches have done, and not what the court thinks it should be…It is not the role of court to veto, or rewrite, laws that it believes are unwise or imprudent,” he says on his website. While the primary voter turnout was only 11.9%, that’s well above the 7.3% average turnout for a spring primary where the state Supreme Court is the only statewide contest. It’s also notable that combined, the two left-leaning candidates, Dallet and Burns, received almost 40,000 more votes than the conservative candidate Screnock. Political spectators are waiting to see if that vote differential occurs in the April general election. The court currently has a 5-2 conservative majority. Depending on April’s victor, the conservatives may maintain that balance, or lead by just one justice.